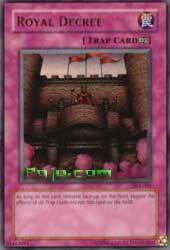 As long as this card remains face-up on the field, negate the effects of all Trap Cards except this card on the field. Welcome to Nationals Preparation Week! (That's really just a fancy way of saying all the cards in this week's CotDs will probably be seen in a Deck at Nationals.) I would like to personally thank Tony for pulling a complete opposite on the playability of the cards from last week. If you're up against this card in a Duel, and your opponent is over the age of 14, they seriously know what they're doing. This card has its pros and cons, but isn't too horrible to have to go up against. Continuous Traps have this huge flaw about being weak to that card...if MST kills it in a chain, it's essentially negated. What many Duelists end up using this card as is an anti-Waboku. A duelist with a Waboku down, 9 times out of 10, feels they are safe barring a Jinzo. So they won't activate the Waboku until the attack comes. Opponent chains Decree to it, and that really hurts. Even IF the player has MST in their hand, they can't chain it from there because it's not their turn. This is a good strategy card -- it takes precision to use it well, but could thwart some well-laid plans. I file this in the category of Painful Choice in a non-Chaos or Exodia deck, or Mirage of Nightmare in general -- I wouldn't recommend it to a newb to put in their Deck (like they'd even be able to get one) but it is a nice card. Well, we're finally reviewing Royal Decree, the TP4 Ultra Rare. This is basically Jinzo in Trap form; Decree is a Continuous Trap that, ironically enough, negates all other Traps. This can certainly be good –chain it to your opponent's Mirror Force, Cylinder or Imperial Order and watch him cry. However, people don't tend to run many Traps these days, what with the prevalence of Jinzo and M/T removal; therefore, Royal Decree will more often than not be completely dead weight. Add in the fact that there's no way to get rid of it (save removing it yourself or waiting for your opponent to do it) and you have a pretty iffy card. If there were a small upkeep cost, Royal Decree would be a lot better. The thing is that whereas Jinzo will give you a 2400 ATK monster on the field while negating Traps, Decree will only negate Traps, doing absolutely nothing else. You get the disadvantages of Jinzo (negating your own Traps as well as your opponent's) without the biggest advantage. That's why Decree isn't restricted and should only be run in a deck that really fears Traps. Why is this card good? It's a trap Jinzo. Jinzo for the longest time have been everyone's favorite tribute monster. After the CED/BLS came out, more people started to favor Airknight Parshath. Hence, I turned to Royal Decree. It's not a Jinzo but I still have a Jinzo. My opponent activates Torrential Tribute, I chain with Royal Decree. My opponent chains Waboku to Breaker the Magical Warrior's Effect, I chain Royal Decree. My opponent Mirror Force's my field? Nope, Royal Decree. It's basically having the Call of the Haunted/Jinzo trick during Battle. Also, if you have Royal Decree down first turn and they MST it, WHO CARES?! You still have at least 2-3 MST, Harpie's Feather Duster, Breaker the Magicial Warrior, and maybe Jinzo/Heavy Storm, etc...My point is that Jinzo is a great tribute monster and so is Airknight. Most of us cut Airknight OVER Jinzo because running 2 tribute monsters is tough. Royal Decree just became a Jinzo. 2) I have Call of the Haunted on an Airknight Parshath. My opponent searched for a Breaker the Magical Warrior when I destroyed his Witch of the Black Forest. Next turn he summons Breaker the Magical Warrior and uses his effect on Call of the Haunted. I chain with Royal Decree (( negating the Call of the Haunted's effect and that means my Airknight just got a Jinzo effect ^^ )) and my opponent loses because he has no answers to Airknight. 3) My opponent plays Confiscation and notices my SPELL CARDS ONLY HAND! He then sets Imperial Order and other stuff and says go. I top deck Royal Decree. I set it and he doesn't do anything to it. I then activate Royal Decree and play my magics because he didn't set MST b/c he didn't think I would set anything important. (( Also pulled off in tournament )). 4) My opponent has two Spells/Traps set on his side of the field. I know one of them is Mirror Force and the other one is a bluff. I just summon my Yata-Garasu and attack. He chains with Mirror Force but you have a card that says "you can't win with any traps down there" card called Royal Decree ^^. 5) Uhh, just trap removal? Do you guys get the point? This card is not just a 100 dollar card. It does stuff! I mean if you think about it, it's like a Jinzo. I've always belived that running at least 6 answers ((I consider 3 MST only 2 answers if you play with Mirage of Nightmare)) for Spell/Trap removal are the best. Jinzo, Royal Decree, Harpie's Feather Duster, Heavy Storm, Mystical Space Typhoon, Breaker the Magical Warrior, Dust Tornado, etc...I normally like to run Harpie's Feather Duster, 3 Mystical Space Typhoon, Heavy Storm, Breaker the Magical Warrior, and Royal Decree. Try playing with Royal Decree and see if you would play with it in constructed. Though I must warn you, playing even 5 traps with Royal Decree can screw you up sometimes. I also belive that running Heavy Storm with Royal Decree is also another Staple. You have to play with this card to understand this card but trust me, you will love it. Take it from me...this card is too much fun ^^v !! Well well, another over-expensive English card. Woohoo! I want it! J/k. Anyway today the specially picked card is Royal Decree. Its a decent trap. gets owned easily) This WOULD work well with Spell Canceller on the field! if you "negate the effects of all Trap Cards except this card on the field"
there are more than big handful of cards that own Royal Decree? Bah! Trade bait. Stick with the Jinzo, and the m/t removal.